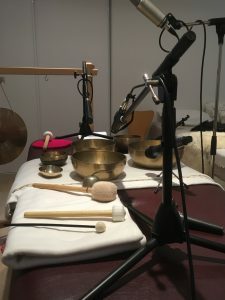 Loop Theory recently went mobile to record a set of tracks for local practitioner Ute Coleman of Sound Relaxation. The day was spent trying and experimenting with different recording techniques to capture the essence of the Peter Hess Sound Bowls, as well as other instruments. 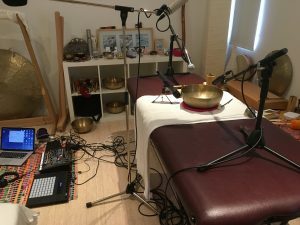 The day posed many challenges, including mic placement, as well as the resonance of the instruments and also the need to have high gain to capture the different frequencies. 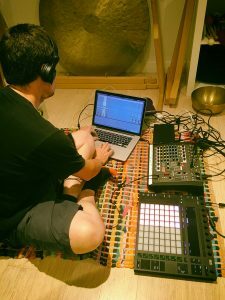 Also a challenge for producer Chris Archibald was to not get too in-depth into the sounds, as they are transporting and transcendental to say the least! Look out for the sounds when they are released as an accompaniment to Maggie Dent’s relaxation methodology.